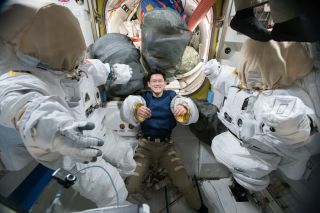 Astronaut Norishige Kanai of the Japan Aerospace Exploration Agency tries on a pair of spacesuit sleeves inside the Quest airlock of the International Space Station. NASA officials on Saturday (Jan. 27) postponed a planned spacewalk at the International Space Station this week after developing a software patch for a glitch that two astronauts had expected to fix during the spacewalk. Astronauts Mark Vande Hei of NASA and Norishige Kanai of the Japan Aerospace Exploration Agency were scheduled to spend more than six hours working outside the space station on Monday (Jan. 29). Their goal, NASA officials said, was to replace a latching end effector (LEE) that serves as the grappling end of the station's robotic arm. To address the LEE glitch, NASA replanned Monday's spacewalk Vande Hei and Kanai (which was already scheduled) to replace the new LEE with the older one removed on Tuesday. But engineers with the Canadian Space Agency — which provided the station's robotic arm system — found a software patch to fix the LEE communications glitch. That means Vande Hei and Kanai won't have to go outside and replace the LEE on the robotic arm, NASA officials said. Instead, the astronauts will venture outside in mid-February to perform the tasks that were originally scheduled for their spacewalk. They include installing LEE removed from the station's arm Tuesday to a new location on the outpost's railcar-like Mobile Transporter, and bringing a still-older LEE removed from the station's arm in October inside the station.